This article is about the semi-secret research subsidiary of Alphabet Inc.. For the Canadian television series, see X Company. For the online banking company, X.com, see PayPal. For other uses, see X (disambiguation). X Development LLC. (formerly Google X) is an American semi-secret research and development facility and organization founded by Google in January 2010, which now operates as a subsidiary of Alphabet Inc. X has its headquarters about a mile and a half from Alphabet's corporate headquarters, the Googleplex, in Mountain View, California. Work at X is overseen by entrepreneur scientist Astro Teller, as CEO and "Captain of Moonshots". The lab started with the development of Google's self-driving car. On October 2, 2015, after the complete restructuring of Google into Alphabet, Google X became an independent Alphabet company and was renamed to X. On 25 October 2018, The New York Times published an exposé entitled, "How Google Protected Andy Rubin, the ‘Father of Android’". The company subsequently announced that "48 employees have been fired over the last two years" for sexual misconduct. A week after the article appeared, Google X executive Rich DeVaul resigned pursuant to a complaint of sexual harassment. X's mission is to invent and launch "moonshot" technologies that aim to make the world a radically better place. A moonshot is defined by X as the intersection of a big problem, a radical solution, and breakthrough technology. Google Glass with black frames for prescription lenses. Project Glass is a research and development program by Google to develop an augmented reality head-mounted display (HMD). The intended purpose of Project Glass products would be the hands-free displaying of information currently available to most smartphone users, and allowing for interaction with the Internet via natural language voice commands. One Google Glass costs $1500. Makani is a current project that was acquired by X in May 2013 designed to produce wind energy using kites. The T-shaped planes are 85 feet wide and contain 8 turbines tethered to the ground. Compared to wind turbines, Makani's kites require 90% less material. In December 2016, Makani's kite became the first energy kite in the world to generate electricity. X is currently conducting tests of free-space optical communication (FSOC) in rural areas of India. The technology uses light beams which are developed by X's office in Visakhapatnam. As of December 2017, X had set up 2,000 of these units in India, through a partnership with Andhra Pradesh State FiberNet Limited. In October 2013, the existence of four Google barges was revealed, with the vessels registered under the dummy corporation By And Large. Two of the barges have a superstructure whose construction has been kept under the utmost secrecy, while speculations indicate they could be used as marketing for, and stores for, Google Glass. However, these are merely speculations. Others have suggested that it might be used as a floating data center. A Waymo self-driving car on the road in Mountain View. Waymo was a project by Google that involves developing technology for driverless cars. In December 2016, Google transitioned the project into a new company called Waymo, housed under Google's parent company Alphabet. The project was led by Google engineer Sebastian Thrun, director of the Stanford Artificial Intelligence Laboratory and co-inventor of Google Street View. Thrun's team at Stanford created the robotic vehicle Stanley which won the 2005 DARPA Grand Challenge and its US$2 million prize from the United States Department of Defense. The team developing the system consisted of 15 engineers working for Google, including Chris Urmson, Mike Montemerlo, and Anthony Levandowski, who had worked on the DARPA Grand and Urban Challenges. The U.S. state of Nevada passed a law in June 2011 concerning the operation of driverless cars in Nevada. Google had been lobbying for driverless car laws. The license was issued to a Toyota Prius modified with Google's experimental driver-less technology. As of March 2016[update], Google had test driven their fleet of vehicles, in autonomous mode, a total of 1,498,214 mi (2,411,142 km). A Project Loon research balloon. 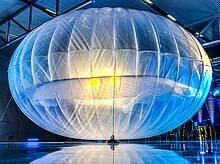 Project Loon was a project of X that aims to bring internet access to everyone by creating an internet network of balloons flying through the stratosphere. It uses wireless routers in balloons that are above weather and plans to give access to the internet to those who can't reach it or are in need of help. In July 2018, Loon graduated from X and was made a subsidiary of Alphabet. Project Wing was a project of X that aims to rapidly deliver products across a city by using flying vehicles, similar to the Amazon Prime Air concept. At the time of the announcement on August 28, 2014, it had already been in development secretly at Google for about two years, with full-scale testing being carried out in Australia. The flying vehicles take off vertically, then rotate to a horizontal position for flying around. For delivery, it hovers and winches packages down to the ground. At the end of the tether is a small bundle of electronics which detects that the package has hit the ground, detaches from the delivery, and is pulled back up into the body of the vehicle. Dropping the cargo or landing were found to be unfeasible, as users compromised the safety. Malta was started in July 2017 to develop renewable energy storage systems by utilizing tanks of molten salt. The system works by transforming electrical energy to heat energy for storage, based on research by Robert B. Laughlin. Malta Inc. graduated from X in December 2018 with plans to develop a large-scale test of the technology for future commercial applications. The Google Contact Lens, a smart contact lens that aims to assist people with diabetes by constantly measuring the glucose levels in their tears, was announced by Google on January 16, 2014. This project, the nanodiagnostics project to develop a cancer-detecting pill, and other life sciences efforts are now being carried out by Verily. Google Brain is now a deep learning research project at Google which started as an X project. Considered one of the biggest successes, this one project has produced enough value for Google to more than cover the total costs of X, according to Astro Teller. Dandelion was spun out as a company not under the Alphabet umbrella, aiming to sell geothermal energy systems to consumers. Foghorn, a project to produce liquid hydrocarbon fuel for vehicles using sea water as a source of carbon dioxide, extracted using membrane technology, and also as a source of hydrogen, using electrolysis. The project was killed by X in 2016 and the results published in 2018. Calcifer explored using lighter-than-air vehicles to move freight at lower cost in countries with poor transportation infrastructure. Abandoned in 2014 due to the high cost of prototyping and limited expected impact. The web of things, a way of connecting real-world objects to the Internet. FSOC Free Space Optical Communications, a spin-off from Loon that uses lasers to communicate through the air over relatively long distances. A pilot project is planned for Andhra Pradesh state in India. Projects that X has considered and rejected include a space elevator, which was deemed to be currently infeasible; a hoverboard, which was determined to be too costly relative to the societal benefits; a user-safe jetpack, which was thought to be too loud and energy-wasting; and teleportation, which was found to violate the laws of physics. In February 2016, Astro Teller, the X "Captain of Moonshots", gave a TED talk in which he described the X approach to projects. Unusual characteristics of the approach included constantly trying to find reasons to kill off projects by tackling the hardest parts first, and both celebrating and rewarding staff when projects were killed off due to failure. On May 17, 2018, an internal video entitled The Selfish Ledger was leaked by The Verge, regarding reshaping society through total data collection. A spokesperson stated that "This is a thought-experiment by the Design team from years ago that uses a technique known as ‘speculative design’ to explore uncomfortable ideas and concepts in order to provoke discussion and debate. It's not related to any current or future products." A number of companies have been acquired and merged into X, covering a diverse range of skills including wind turbines, robotics, artificial intelligence, humanoid robots, robotic arms, and computer vision. In 2013, X acquired Makani Power, a US company which develops tethered wings/kites with mounted wind turbines for low cost renewable energy generation. In 2014, it acquired product design and mechanical engineering firm Gecko Design, whose previous products included the Fitbit activity tracker and low-cost computers. As of 2015, X has acquired 14 companies: among them are Redwood Robotics, Meka Robotics, Boston Dynamics, and Jetpac. In June 2017, X sold Boston Dynamics to SoftBank Group. A reporter from Bloomberg Businessweek visited the site in 2013 and described it as "ordinary two-story red-brick buildings about a half-mile from Google's main campus. There's a burbling fountain out front and rows of company-issued bikes, which employees use to shuttle to the main campus." ^ Rowan, David (October 31, 2013). "Astro Teller of Google[x] wants to improve the world's broken industries". Retrieved January 25, 2014. ^ "Secret Google lab 'rewards failure'". Newsnight. BBC. January 24, 2014. Retrieved January 25, 2014. ^ "Google to be publicly traded under Alphabet Inc. in planned restructuring". Retrieved August 10, 2015. ^ a b Stone, B rad (May 22, 2013). "Inside Google's Secret Lab". Businessweek. Retrieved May 26, 2013. ^ a b Cain Miller, Claire; Bilton, Nick (November 13, 2011). "Google's Lab of Wildest Dreams". The New York Times. Retrieved February 23, 2012. ^ Shontell, Alyson (September 18, 2013). "Meet The Mastermind Behind Driverless Cars, Glass And More: Google's 'Chief Of Moonshots,' Astro Teller". Business Insider. Retrieved January 25, 2014. ^ a b Gertner, Jon (April 15, 2014). "The Truth About Google X: An Exclusive Look Behind The Secretive Lab's Closed Doors". Fast Company. Retrieved April 17, 2014. ^ Welch, Chris (25 October 2018). "Google says 48 people have been fired for sexual harassment in the last two years". The Verge. Retrieved 31 October 2018. ^ Musil, Steven (30 October 2018). "Google exec accused of sexual harassment leaves company". CNET. Retrieved 31 October 2018. ^ "A Peek Inside the Moonshot Factory Operating Manual" Check |url= value (help). The Team at X. 2016-07-23. Retrieved 2018-04-24. ^ Goldman, David (April 4, 2012). "Google unveils 'Project Glass' virtual-reality glasses". Money. CNN. ^ Albanesius, Chloe (April 4, 2012). "Google 'Project Glass' Replaces the Smartphone With Glasses". PC Magazine. ^ Newman, Jared (April 4, 2012). "Google's 'Project Glass' Teases Augmented Reality Glasses". PCWorld. ^ Shankland, Stephen (May 23, 2013). "Google X acquires kite-power startup Makani". CNET. CBS Interactive. Retrieved July 13, 2018. ^ Bergen, Mark (August 4, 2017). "Alphabet's Green Energy Ambitions Hit Turbulence". Bloomberg News. Retrieved July 13, 2018. ^ Li, Abner (August 4, 2017). "Various clean energy moonshots at X have hit roadblocks, including Makani kite project". 9to5Google. Retrieved July 13, 2018. ^ Phadnis, Shilpa (February 22, 2018). "Alphabet's X provides high-speed internet without fiber in AP". The Times of India. Retrieved July 21, 2018. ^ "Google X ready to set up Development Centre in Visakhapatnam". Hindustan Times. December 15, 2018. Retrieved July 21, 2018. ^ U N, Sushma (December 15, 2017). "Alphabet's X will use light beams to bring the internet to millions of rural Indian households". Quartz India. Retrieved July 21, 2018. ^ Casey Newton. "Google plans to dock mystery barge at former Army post in San Francisco". The Verge. ^ Sebastian Thrun (October 9, 2010). "What we're driving at". The Official Google Blog. Retrieved October 11, 2010. ^ Alex Knapp (June 22, 2011). "Nevada Passes Law Authorizing Driverless Cars". Forbes. Retrieved June 25, 2011. ^ John Markoff (May 10, 2011). "Google Lobbies Nevada To Allow Self-Driving Cars". The New York Times. Retrieved May 11, 2011. ^ Mary Slosson (May 8, 2012). "Google gets first self-driven car license in Nevada". Reuters. Retrieved May 9, 2012. ^ "Google Self-Driving Car Project Monthly Report - March 2016" (PDF). Google. Retrieved March 23, 2016. ^ "Official website of project Loon". ^ Koulopoulos, Thomas (July 2018). "The Moonshot to Create the Next Google". Inc. Retrieved July 13, 2018. ^ "Droning On". AOPA Pilot: 63. April 2015. ^ Kovach, Steve (31 July 2017). "Alphabet's 'moonshot' lab has a new project to store renewable energy". Business Insider. Retrieved 27 December 2018. ^ Wiggers, Kyle (19 December 2018). "Alphabet's X lab spins out molten-salt energy storage project Malta". VentureBeat. Retrieved 27 December 2018. ^ Hanley, Steve (21 December 2018). "Google X Spins Off Malta Molten Salt Energy Storage Business". CleanTechnica. Retrieved 27 December 2018. ^ "Introducing our smart contact lens project". January 16, 2014. Retrieved July 31, 2016. ^ "Why Google's Cancer-Detecting Pill Is More Than Just Hype". November 5, 2014. Retrieved July 31, 2016. ^ "Official website of X". ^ "They Promised Us Jet Packs". July 23, 2016. Retrieved July 31, 2016. ^ "Astro Teller, Google's 'Captain of Moonshots,' on Making Profits at Google X". February 6, 2015. Retrieved July 31, 2016. ^ "Google's X lab is working on batteries that last longer". WSJ. April 11, 2015. Retrieved November 11, 2015. ^ Gayomali, Chris (April 15, 2014). "Google X Confirms The Rumors: It Really Did Try To Design A Space Elevator". Fast Company. Retrieved April 17, 2014. ^ Gayomali, Chris (April 15, 2014). "This Is Why We Don't Have Google X Hoverboards Yet". Fast Company. Retrieved April 17, 2014. ^ a b Mack, Eric (May 6, 2014). "Four Crazy Google X Projects That Failed". Forbes. Retrieved May 9, 2014. ^ "The unexpected benefit of celebrating failure". TED. Feb 2016. Retrieved June 3, 2016. ^ "Google's Selfish Ledger is an unsettling vision of Silicon Valley social engineering". The Verge. Retrieved 2018-05-19. ^ "Google acquires kite-power generator". BBC News. Retrieved May 23, 2013. ^ a b Miners, Zach (August 22, 2014). "Google acquires Gecko Design for next-generation products". Retrieved August 22, 2014. ^ D'Angelo, Alexa (June 9, 2017). "Why Google wanted to sell – and Softbank wanted to buy – Boston Dynamics, which makes crazy robots". Los Angeles Times. Retrieved June 9, 2017. Wikimedia Commons has media related to X (company).